The design proposal operates through the multiple scales of the site and local neighbourhood to celebrate and amplify its qualities, whilst simultaneously creating a unique iconic focus. Viewed from a distance, the iconic strength is derived from the single clean gesture of the skyward projection of the vertical tower. The tower affords privileged unobstructed views into, and across, the entertainment city block from its residences and into the city of Changzhou. 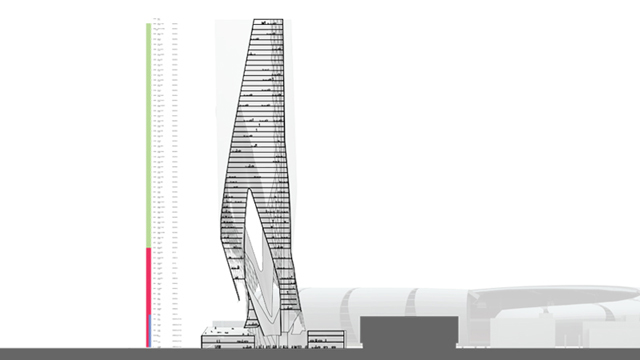 In contrast, the horizontal tower addresses the local street corner and the scale of the existing urban fabric. The resulting composition of the two towers choreographs multiple shifting iconic readings through various scales. In this manner the design is able to visually connect with the entertainment precinct - which contains a collection of other singular buildings such as the stadium, and the exhibition building - and the street’s surrounding mid-rise neighbourhood. The third compositional element of the design is the commercial component that stiches the towers together, and draws people diagonally though the site connecting the residential areas with the entertainment, education, and commercial districts both of the site and its surrounds. The design proposal is the final piece in the puzzle that creates an iconic focus for the entertainment district, whilst bridging the various scales and programs of the neighbourhood, to simultaneously create, maximise and amplify retail, commercial and residential opportunities.